Since natural gas is the cleanest burning fossil fuel available today and costs less than diesel, gasoline, and LPG, more and more trucks and buses are running on liquefied natural gas (LNG). To meet increasing demand, LNG depots are being built in remote locations to service mining and other industries. This presents a range of issues such as the difficulty of safe and reliable dispensing of LNG at remote unmanned sites and the tracking of LNG distribution and sales for inventory and billing purposes. When a truck refuels at an unmanned station, the driver presses the start button and the message "Enter ID number" is displayed on the local HMI. When the ID entered at the local HMI is authenticated by the controller, the LNG dispensing sequence starts. The controller starts a pump to circulate liquefied gas and cool down the flowmeter. LNG is then dispensed to the truck. Then, the controller compensates the flow volume using a customized equation for custody transfer based on the measured temperature and pressure. On completion of each dispense, flow data is saved in the controller as a file. At the end of the day a report is created by compiling all the day' s dispenses on the controller and is automatically e-mailed to the office for billing purposes. 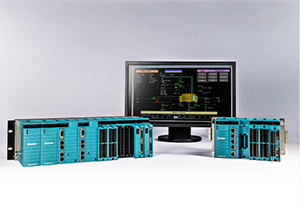 Yokogawa provides an innovative automatic custody transfer system for unmanned LNG fuel stations that uses the STARDOM FCN controller and a cryogenic version vortex flowmeter. LNG that vaporizes and mixes with air in the proper proportions can ignite. To prevent accidents at remote gas stations, the controller is stored in a cabinet with an intrinsically safe barrier. An ID file storing fleet ID information has been loaded onto the controller and can be modified online by accessing the controller web page. When the truck driver presses the start button, "Enter ID number" is displayed on the local HMI. When the fleet ID number is entered into the local HMI, the ID number is sent to the controller and compared with the ID information in the file. When the ID is authenticated, the controller initiates the LNG dispensing sequence. However, if the ID is not authenticated, an error message is displayed on the local HMI. After the ID is authenticated, the controller starts a pump to circulate liquefied gas through the pipe until the temperature falls low enough for single-phase liquid flow. If this cannot be achieved within a given time frame, the controller stops the pump, displays an "error" on the local HMI, and returns to idle. When the temperature is low enough, the controller opens the valve and slowly ramps up the pump speed to avoid tripping due to sudden increases in back pressure. During the dispensing, the pressure is monitored and, if it goes high (due to back pressure problems or the tank being full), filling stops. 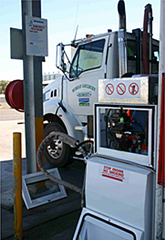 If the truck has more than one tank to fill, the local HMI prompts the driver to connect to the next tank and continue filling. Once completed, the local HMI displays the total amount dispensed, and a report is created in the controller. The Yokogawa DY cryogenic version vortex flowmeter handles process temperatures as low as -200 deg C with high accuracy (liquid: ±0.75%). Flow (measured by the Yokogawa cryogenic version vortex flowmeter) as well as temperature and pressure are transmitted to the controller. The flow is compensated to the base temperature using a customized equation for custody transfer. On completion of each dispense, the corrected flow, temperature, and pressure are saved as an Excel compatible CSV file in the controller's compact flash memory. This log file can be uploaded on demand to a PC using the FTP function and can also be viewed in trend format by accessing the controller web page. At the end of the day, a report file is created by compiling all the day's dispense files. As a default, two daily reports are provided. These are (1) Daily Dispense Report: summary of the day's dispenses, and (2) Daily Status Report: tank level and pump usage. These reports are in Excel compatible CSV format and are completely user definable. The created daily reports are e-mailed to an office for billing purposes via GSM/GPRS or some other Internet connection. Also, these reports can be uploaded on demand to a PC using the FTP function and can be opened in Microsoft Excel. The following pages can be accessed at the controller URL: Tuning Parameter Setting: Without the modification of applications, parameters can be set on this parameter web page. These include timer set points, pressure set points, alarm set points, and PID tuning parameters. Also, data logging and report creation configuration can be set. Dispense Trend: The dispensed quantity and historical trend can be monitored in real time. Site Status: Gas station status information such as storage and dispensing quantity and status can be monitored. If an alarm occurs, the controller immediately sends to a specified person an alarm e-mail that contains a log of all process parameters at the time of the alarm.